Last week while perusing the web I came across an amazing Wooden World Map on Vivaterra (no longer available). 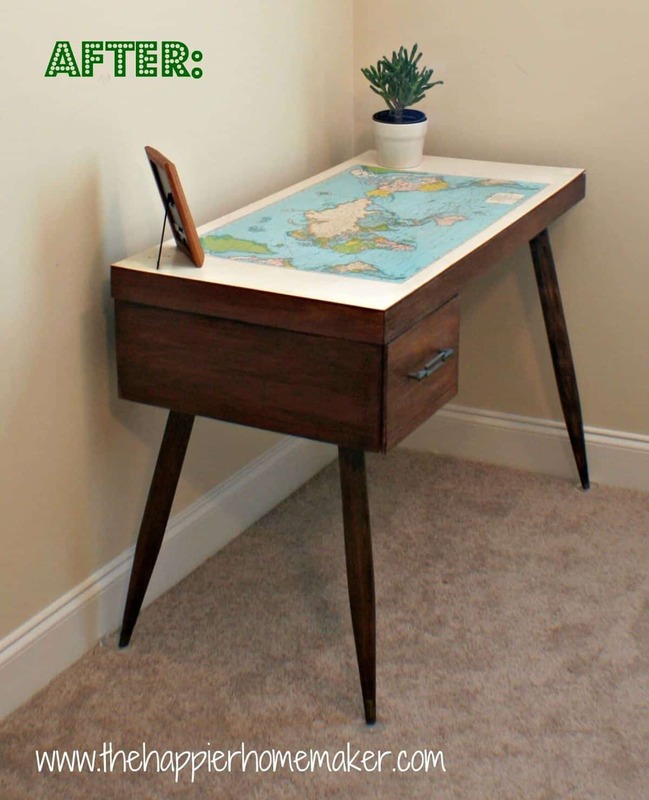 I thought that it would be a gorgeous addition to my son Jack’s room-he is very much a little geography nut. The price tag however-a whopping $475-was not going to work. I knew I could make my own knock-off. 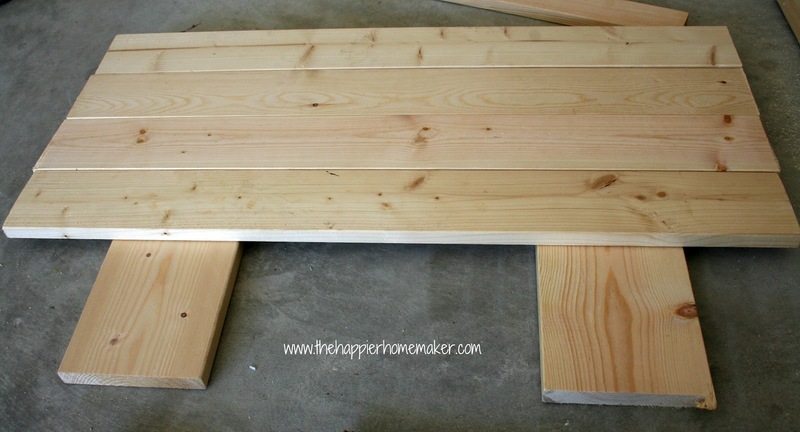 I started by creating a wood base with scraps left over from my DIY Headboard build a while back. 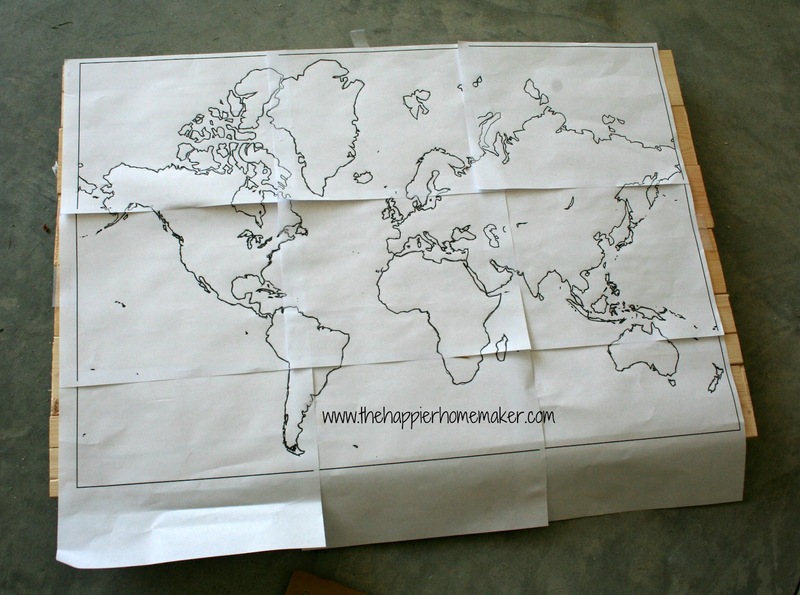 I then printed off a map template online and began the painstaking process of tracing it onto the wood-the easiest way to do this is using carbon paper between the printed map and the wood. The stain you use later will cover the traced lines. 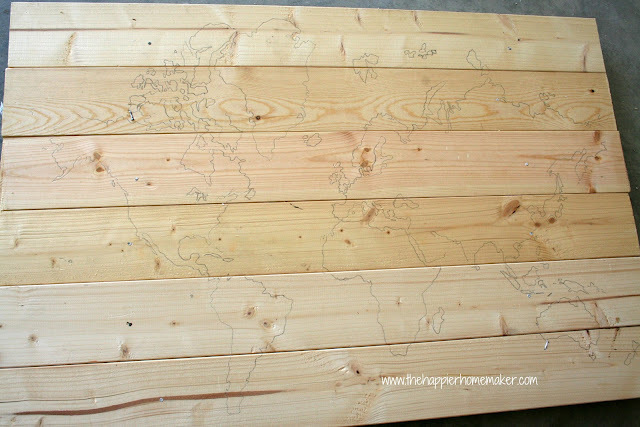 I then used the leftover Mission Oak stain from my headboard project and a small paintbrush to paint the map design onto the wood. Use very fine paint brushes to outline sections at a time then fill in with a wider brush. Updated to add: I used a variety pack of inexpensive brushes like this when I made these maps to sell years ago because the stain pretty much ruins the brushes. Thanks for stopping by! Be sure to follow me on Facebook and Pinterest so you don’t miss the fun! 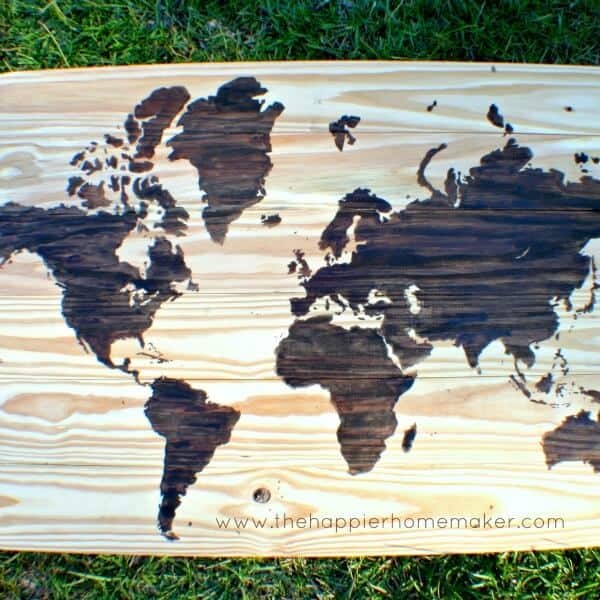 I’m attempting to make this but I’m having major problems with the stain bleeding and I am using the wood conditioner recommended and following the directions on the can. I’ve been racking my brain for things I can use as a barrier over the pencil boarders, glue, crayon wax, etc. But nothing is working. Any tips would we greatly appreciated. Yours is so beautiful, thanks for posting your tutorial! 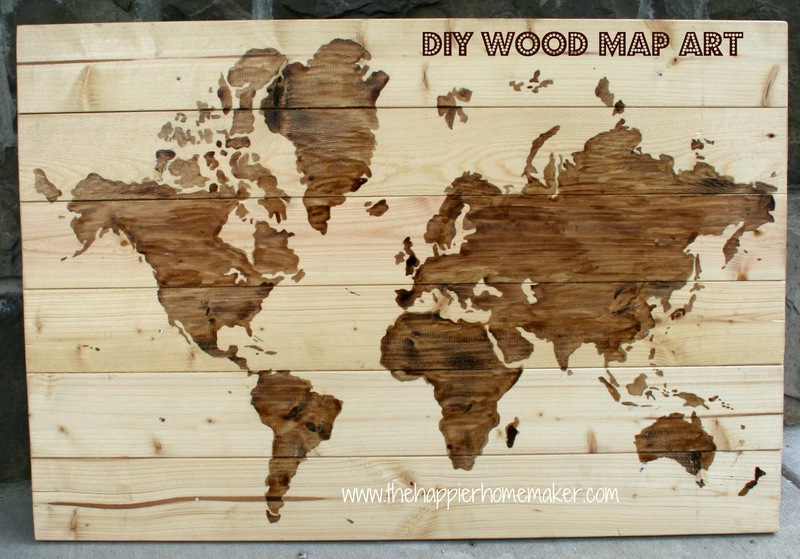 I’m sorry Kira, I’m not sure why you’re getting bleeding if you have conditioned the wood prior…I have never had any issues with it if I did the conditioning step in all the maps I used to make to sell on Etsy. I’m sorry not to be of more help! About to give this a try this weekend. Just wondering what you used to remove any excess stain? or did you just ensure you weren’t using too much at once? I’m either going with the Minwax conditioner & stain or the Varathane stain which doesn’t require conditioning and then following up with polyurethane. My understanding is you sand (going from maybe 120, 150, to a 180 grit), apply the conditioner, waiting at least 15 mins, then removing any excess at which point you can start staining. I’ve heard you can leave the conditioner on as long as you want but wanted to get a sense of what you did over time? Did you trace the map before or after conditioning and sanding? Seems the sanding would erase your tracing. 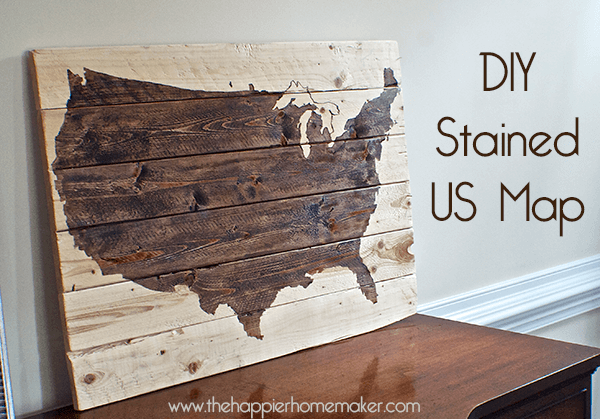 I just tried this DIY and used a wood conditioner but my stain still bled. Does the type of wood used make a difference? If so, what type did you use? Thank you! Hi I saw that you mentioned thewood dimensions were 21″x31″. I was wondering what size map did you use? Hello! I could haave sworn I’ve visited this web site before but after going through some of the articles I realized it’s new to me. Regardless, I’m definitely pleased I discovered it aand I’ll be bookmarking it and checking back regularly! We are making a coffee table, and I wouldn’t love for it to have something extra like this on top. 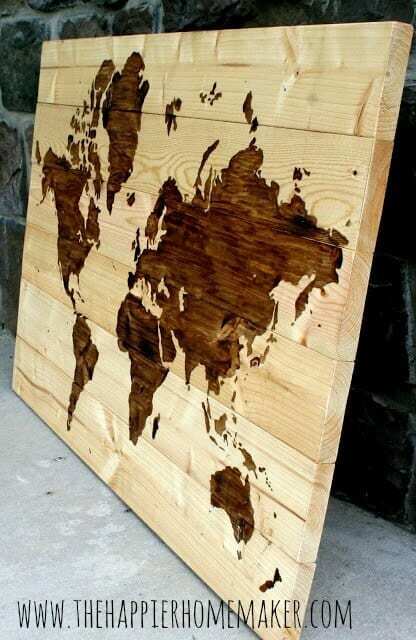 Could you paint the map on and then stain over for a different affect? What paint would you suggest? I knew I could make my own knock-off.